Well you need help? And there is no info about your problem on the official phpwcms project page? 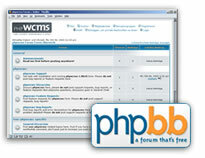 Then give our phpBB2 based support forum a chance. It is for sure the fastest way to get an answer that may help you. Also visit the support forum if you have feature requests or if you would communicate with other phpwcms users or people who are interested in. Please do not email support requests, bug reports, feature requests or development questions to me or other community members! I will only answer on such themes inside the support forum.